Stefan Uros IV Dusan as Czar with Helen, AD 1345-1355. Size : 17.1 x 18.2 mm. Weight : 0.89 grams. 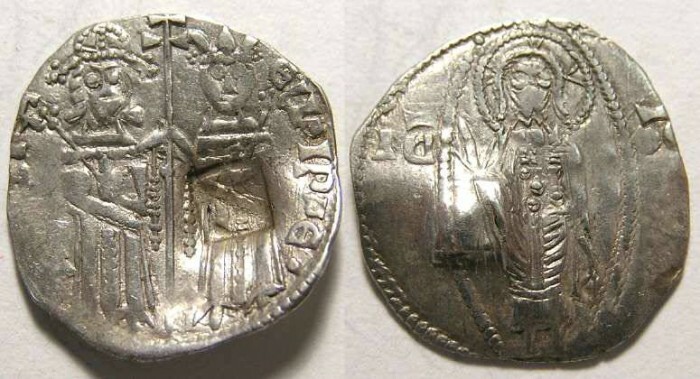 Obverse : Stefan and Helen standing forward with a cross between them and IPOR STFA ELIA IPAE around. There is a square blank countermark on the obverse (the design in the countermark is actually the design originally on the coin showing through). Reverse : Christ standing in an oval, with IC XC at the sides.